If you have decided to build brick patio steps onto your brick patio design, you may be wondering what you have gotten yourself into. Brick patio steps add a useful element to any patio design, and with a little preparation and planning they do not have to be difficult to construct. When you are building brick steps you need to remember that they are going to experience a great deal of use, including a lot of direct pressure and weight placed upon them. That is why it is so important to build your brick patio steps on a solid foundation, generally concrete is the best choice. The first thing that you need to do is frame out and have the concrete steps poured or do it yourself if you are experienced with concrete. Finish the surface and cure the concrete before proceeding with the next steps. Once the concrete is cured and you are ready to move onto the construction of the stairs, you should follow a few simple steps to achieve the best results. 1. Be sure to wet the bricks thoroughly before beginning the project. It is best to do this a few hours before you start as this helps the bricks to not absorb as much mortar. 2. Put ½” thick wet mortar down on the work area, and screed the area with a special screed. Use temporary form boars that are set one brick length apart. The special screed should be level and will ride on the forms and extend down one brick thickness below the forms. 3. As you are moving the screed along the area, place the bricks in the wet cement leaving ½” joints between each brick. You can use a spacer if desired to help you with the spacing. Tap the bricks gently into place using a mallet. 4. Use a trowel to pack concrete into the joints and tool the joints with a concave jointer tool. 5. Wait a few hours until the concrete has had a chance to set a bit and scrub the bricks to remove any stains. When the mortar is dry you can use a stiff brush to remove and dried bits that have been stuck to the brick. 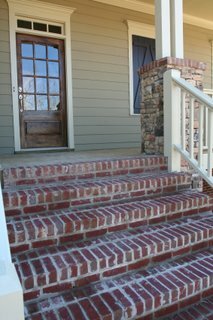 The popular choices for brick patio steps are a basket weave pattern or a running bond. 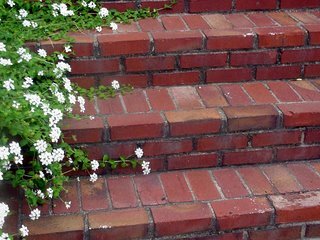 You can turn the bricks up on the sides for the treads of the stairs to create a stronger step as well. Be sure that you are using a high quality brick in your step construction so that the stairs will stand up to high levels of use and stand the test of time for your patio design.